Our regular readers may know that we have been following the use of herbicides in our city parks, and particularly in our so-called Natural Areas. Contrary to their name, they are a major user of herbicides. We collect the monthly pesticide use reports under the Sunshine Act, and compile and analyze them. The good news is that the volume of Tier I and Tier II herbicides used in our parks has dropped considerably. The bad news is that it’s dropped less in Natural Areas. From January through October, SFRPD (excluding Harding Golf Course) used herbicides 126 times. Of those, 107 applications were in Natural Areas. And if we include the NAP-managed areas under SFPUC control (Laguna Honda, Lake Merced), the NAP application number rises to 111 of the 126 applications. NAP made 85% of SFRPD’s herbicide applications. After a sharp increase in herbicide use from 2010 through 2013, the Natural Areas Program finally started reducing their volume of herbicide use in 2014. That continued in 2015, and it seems to be on track to continue through 2016. Total usage is finally going back toward 2008 level (but has not yet reached 2009 levels, the lowest since we started tracking NAP’s herbicide use). NAP’s greatest success has been to reduce Roundup (glyphosate) use. In the first ten months of 2016, it had already increased its use of Garlon (tricyclopir), imazapyr, and Milestone VM (aminopyralid) over 2015 levels. However, they are down from 2013, which was peak pesticide for NAP. We’ve had people asking, so why didn’t they do it before? That’s a good question, but at least they are doing it now. However, the sharp rise between 2009 and 2010 shows that it behooves us to be watchful, since there’s a precedent for an unexpected increase. 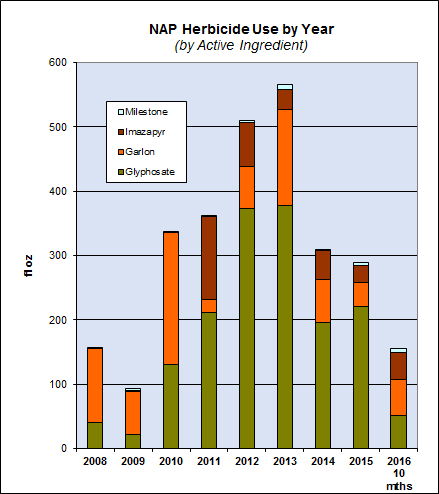 In the first ten months of 2016, NRD (formerly NAP) has already exceeded the amount of Garlon they used in all of 2015. They applied it 19 times, for a total of 95 fl ounces, as compared with 63 fluid ounces used in 13 applications for all of 2015. We expect this number will increase by year end. 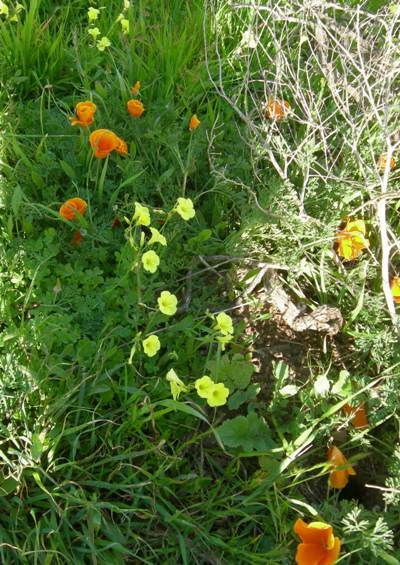 The main reason NRD uses Garlon is against oxalis. With very little evidence other than some assertions by Jake Sigg, they insist that oxalis will destroy all other plants in a landscape. Empirical evidence suggests this is not true. The easy way to stop using using this chemical would be for NAP to stop obsessing about oxalis. They are currently the only users of Garlon in our parks. This would be an easy win for NAP and for SFRPD. They are all concerning. Garlon and Roundup are both hazardous to human health, and imazapyr and Milestone are both mobile in the soil, meaning they don’t stay put, as well as very persistent. The frequent use of imazapyr in forested areas is especially problematic, since it can damage tree roots over time even if it’s targeted at something else, like blackberry. As we mentioned above, while NAP (or NRD) did reduce herbicide use in 2016, the rest of SFRPD did much better. After April 2016, when SF Dept of the Environment had some training sessions for SFRPD, the use of herbicides dropped sharply. 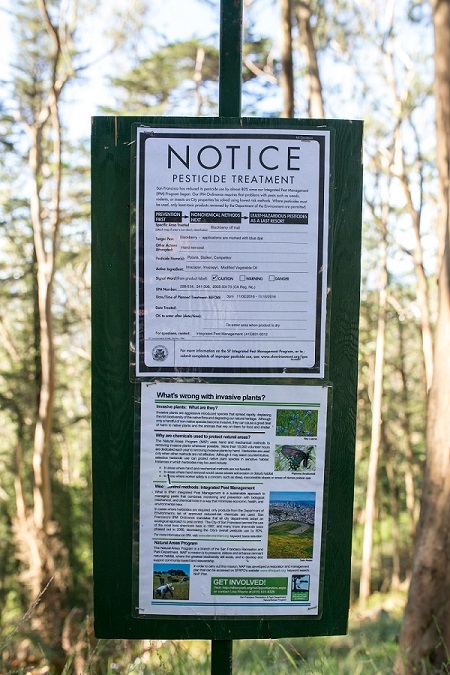 Between May and October, only two departments of SFRPD used herbicides besides the Natural Areas – the Golden Gate Nursery and the Balboa Sports Complex. Most of those were Tier II, not Tier I herbicides. One of the Tier II herbicides that the Nursery used is Greenmatch, actually approved for organic gardening use. It’s only classified as Tier II because of a handling risk with the concentrate, but it is harmless to the public once applied. 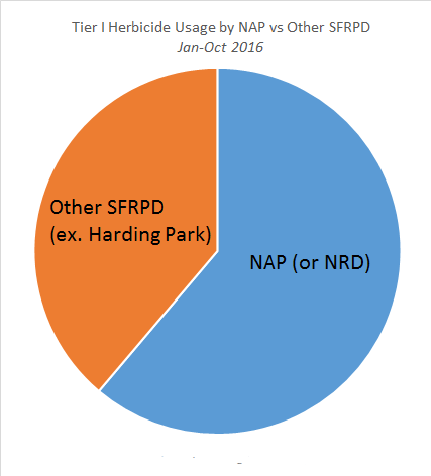 In the first ten months of 2016, NAP, which controls 1/3 of the parkland in San Francisco, used nearly 2/3 of the Tier 1 herbicides. NAP (or NRD) used 44% of the Roundup used in our parks, 100% of the Garlon, and around 99% of the imazapyr and Milestone VM. This pattern of frequent use, together with the fact that NAP still applies more herbicides than any comparable parks area, makes for a great deal of public uncertainty. With over 100 applications a year, park users are quite likely to encounter herbicide spraying. Furthermore, as people have started observing and reporting, it’s also becoming apparent that the notices – and possibly the reports – are not always accurate, and that guidelines are not always followed. At the recent hearing, the public expressed concern about herbicides in runoff and ground water. 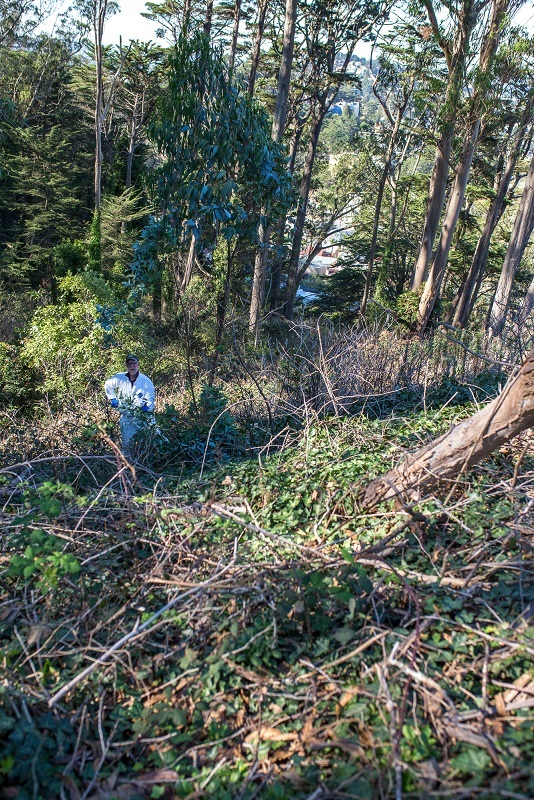 We renew our call to SFRPD to stop using herbicides in Natural Areas altogether. Is that really it? Is there no further recourse to stop this unbelievable destruction of such a beautiful forest? It makes me sick to my stomach. I went up the hill yesterday and cried thinking about all the trees being killed.